Let me start by saying I realize I’m pretty new here. And if you’re asking yourself "why" a newbie would even do a review on this particular helmet, the answer is simple – I bought one. And the fact, that there are VERY few reviews out there on this particular helmet. What few reviews there are, are at least 2 years old! I also hope that if anyone is interested in a KBC helmet, this review might help, rather than spending 3 months searching for some kind of "in-depth" info like I did! I’ve been throwing around the idea of doing a "first impressions" review for this helmet since I got mine. I began reading reviews on it (again, what few there were) as well as other comparably priced helmets almost nine months ago, while in the market for a new helmet. After quite a bit of research I came to the realization that a lot has changed in the helmet industry, which did little in making a helmet choice any easier! After making the VR-2R my choice; receiving it in August 2009, and riding in it for the remainder of the season, I decided it was time to do my part. This review is probably a little over-due and I almost passed on doing it, thinking there would be some serious changes with the new Snell2010 certifications released back in July 2009. So far however, I’ve only seen a few minor changes in the 2010 helmet line-ups for most manufacturers, with the majority of those being graphics. That's not so say there won't be some major changes, but I haven't seen any yet. As for KBC they’ve only introduced one "new" helmet that I’m aware of for 2010 and it’s not even a full-face helmet. This review is a little "long", but then again, I don’t claim to be a proficient writer. A little too passionate (maybe) about motorcycling, but I’m pleading insanity as my defense. Why KBC? Well I liked what I saw. 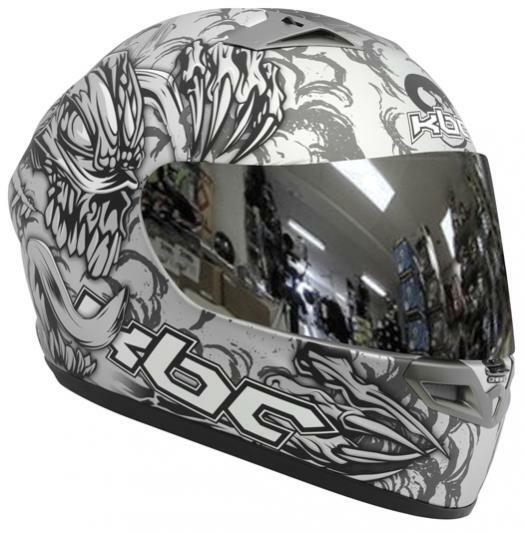 KBC isn’t one of the "better-known" helmet manufacturers to begin with, although no-more-so than say Scorpion. Having been inducted into motorcycling with a Shoei X-8 on my head, I probably would have considered another Shoei lid, IF it weren’t for the $500+ price tag for the comparable X-11! Taking into consideration that the X-11 is considered Shoei’s "top-of-the-line" helmet and is "race" inspired, I wanted a comparable replacement. And since KBC’s VR-2R is considered the company’s flagship helmet and also race inspired this seemed like a good alternative. It’s been more than 18 years since I’ve looked into helmet technology and as stated, a LOT has changed in the helmet industry! The largest change being the shear number of "new" helmet manufacturers to choose from. And from what I’ve seen these new manufacturers are honestly giving the old icons a competitive run for their money. However I realize that helmets (in general) are a hot topic of contention among motorcyclists and – by comparison – are like owning a Ford or a Chevy. The few reviews I managed to find regarding the KBC VR-2R, were those primarily done by the general public with the majority of those coming from here: http://www.motorcycle-superstore.com...C-Helmets.aspx As for "experienced" review sources, such as motorcycle publications and the like, those have been even more elusive! Only one source seems to be "dedicated" in supplying the general motorcycling public with in-depth reviews on helmets as well as other riding gear. That source is http://www.webbikeworld.com/. However, these experienced review sources seem to review helmets which "they choose" to review, and that’s pretty much the extent of it. Granted it would take a full-time staff to review every single helmet manufactured today, but if you’re going to do a review on a particular helmet, at least try to keep it updated. For the most part, webbikeworld.com has not updated its reviews, for KBC helmets (in general) in quite some time. I’m willing to bet that’s probably the case with most all review sources regarding helmets from these new manufacturers. Why? I personally think it’s a matter of stereotyping. KBC, Scorpion, and other similar helmet manufacturers, who can offer the same protection (DOT & Snell certified) as say a Shoei or an Arai for less than $300 are unfortunately considered "sub-standard" in the helmet industry. There’s that Ford and Chevy thing I mentioned. That however could NOT be further from the truth! In fact the most recent review done by webbikeworld.com on a KBC helmet was done well over a year ago! (December 2008) Even more frustrating, the closest comparison to the VR-2R was a review done way back in 2006 on the VR-2 when it was first introduced! In reality, the VR-2R and VR-2 are (for the most part) the same helmet, with only a couple of "feature upgrades." The basic shell hasn’t changed and having had a good look at a VR-2R, I could definitely see these feature upgrades, which seemed directly related to webbikeworld.com’s VR-2 review. And in my opinion these upgrades (although minor) warranted an updated review if little else. But again no such review has been done to my knowledge, so I decided I would attempt to do my own. Unfortunately it would seem that most "experienced" review sources still view the VR-2R and VR-2 as the exact same helmet in every aspect. Again although true for the most part, these minor upgrades/features ARE note-worthy. I contacted webbikeworld.com and asked "why" they hadn’t written a more recent review for the VR-2R (or any) KBC helmet for that matter. The reply seemed more like a blow-off than an explanation. Basically they said they had not seen where KBC had made that many "innovative changes and/or improvements" from their original design over the past 5 years. I’m betting that's probably the case with most every helmet manufacturer when referring to "shell design", especially with regard to the new Snell2010 certifications. As stated, there have only been minor upgrades to the VR-2R, since its older sibling (the VR-2) was introduced in 2006. In fact according to info I received from a KBC rep there have only been two (2) upgrades, which they actually consider note-worthy. Webbikeworld.com’s 2006 review of the VR-2 however, pointed out two very "specific complaints" with the 06 model, which were poignant enough that the writer included photos in the review to illustrate. My own look at a VR-2R showed that these two specific complaints had been addressed by KBC. Quite admirably I might add. Almost as if KBC had made the changes in direct response to webbikeworld.com’s review of the older VR-2! Yet when asked "why" they had not done a more updated review with regard to these changes, they indicated they couldn’t see "enough change" in the VR-2R to warrant such a review?! Hmmm. I suppose if the helmet in question isn’t one of the top brands, a review isn’t warranted but (maybe) every 5 years or so. Let’s get down to business. "First Impressions" of the KBC VR-2R Alien? Also of note is the "life expectancy" of a helmet. It’s an established "rule-of-thumb" that a helmet’s useful life is around 5 years max from its date of manufacture. Don’t take my word for it please! Take the time to call any helmet manufacturer and ask them how "long" they recommend a helmet is good for. I can almost guarantee the answer will be 5 years max. Personally spending $350-600+ on any helmet (regardless of manufacturer) knowing I’ll have to replace it in 5 years, does not sit well with me. Some say the top brands can be worn longer. Speaking from first-hand experience this is NOT the case. As I stated earlier a Shoei X-8 was my first and only helmet until my recent KBC purchase. I proudly wore the X-8 for more than 10 years! And I can honestly say, after 10 years of use it was pretty much used up! Age, liner deterioration, and significant EPS foam compression had made the helmet useless! I could literally stick my fingers in-between the liner and my forehead! It was so uncomfortable even a cheap (DOT only) helmet felt better on my head! I now believe the 5-year life span is a fair number. And I find it extremely difficult to warrant spending big money on something I’ll ultimately end up having to replace (again) in 5 years. I could easily buy two KBC helmets in the course of 5 years, for what one Shoei or Arai would cost! The question is "why" spend more when you don’t necessarily have to?! Being the "frugal shopper" is also smart with regard to the age and/or manufacturer date of a "new" helmet. Especially if you’re ordering off the internet! At first glance a helmet may be advertised as new, when in fact, the helmet might actually already be 2-3 years old from date-of-manufacture. And if you follow that 5-year life span "rule-of-thumb", you could end up with a helmet that’s only going to offer between 2-3 more years of service life! That’s not good in my opinion and you’re not getting what you paid for! A simple look under the liner will answer this concern no matter what brand of helmet you’re considering, as I think it’s now law that the date-of-manufacture sticker has to be present. Back in July 2009, I looked at a VR-2R (in a local motorcycle shop) and out of curiosity decided to check the date-of-manufacture. Keep in mind this helmet was being sold as a "new" 2009 model. However the date-of-manufacturer on this helmet was 2007! That means (according to the "rule-of-thumb") this helmet only had about 3 years of service life left. As for my VR-2R, which was an internet purchase, I got lucky. The date-of-manufacture was 12/5/2008. That means the helmet wasn’t quite a year old when I received it in late August 2009. I could live with that, especially considering that I didn’t spend near $300 on this lid. So basically the only things left with are aesthetic qualities. And yes some are certainly better than others and this might be where helmets such as Shoei and Arai rise to the top. Unfortunately for these well-established icons, these "other" manufacturers are constantly improving their helmets giving these old standards a real run for their money! Let’s be honest. How many of us have bought a helmet based entirely on what the helmet offers in safety and protection alone? Granted it’s a HUGE criteria, but probably not the first thing we think of when looking for a new helmet. A weekend racer – maybe. Obviously it’s the end result we’re all after, along with a good fit and comfort. But for the majority of buyers (self included) the first thing most of us do is look at the aesthetic qualities. Bottom line… if it doesn’t "look" good, match our riding gear, or our bike, we’ll just move on to the next helmet. The "WOW-factor" (as I like to call it) is off the chart for this helmet! Unfortunately there was no local example of the VR-2R Alien available for me to see and touch prior to purchase, although there were other models of the VR-2R available for fitting. So all I had to base my likes and dislikes on (regarding looks) were photos. That said, how many times have you seen something (in photos) and then when you see it for the first time, it simply WOWS you? That’s what this helmet did for me! To offer you an honest opinion on the finish, let me again refer to webbikeworld.com. A third complaint regarding the 2006 VR-2 review, was directed at the "finish" on the helmet. The writer indicated there were "visible sanding marks due to poor paint preparation." Again a photo was included to illustrate the writer’s point. Giving the writer credit these marks were visible! And I agree, visible sanding marks, or any other marks (for that matter) should never be seen on a helmet. And to that end, I didn't notice anything like this on my VR-2R. Even after running my hand over the surface of the helmet, I didn’t feel anything that would give the impression of sanding marks or other imperfections. The graphics also has a semi-gloss or matt finish – THAT ROCKS! In the end I just didn’t see anything negative or second-rate regarding the finish. The icing on the cake (for me): a silver/chrome mirror visor! After quite a few phone calls and emails to KBC-USA – as well as a number of helmet dealers – I managed to find out a few things that may or may not be public knowledge. First (as stated earlier) there have only been two changes or upgrades to the VR-2R since its older sibling (the VR-2) was originally release in 2006. Both upgrades seem to be indirectly "warranty related" according to what I was told by a KBC rep. If you order a tinted or mirror visor, you’ll also get the entire visor release mechanisms for both sides of the helmet. It’s my understanding there was a problem with the standard clear visor release mechanisms and according to the rep, these would not work properly with any tinted or mirror visor. KBC’s solution was to offer replacement release mechanisms along with the purchase of any tinted or mirror visor. At less than $20 (on ebay) the cost is a real bargain too! Switching everything is a synch! I had everything changed over in less than 10 minutes, including the release mechanisms. Secondly – a defect in the front, top vents on some 2006 models ONLY ultimately inspired the second change/upgrade. I had emailed a large helmet dealer http://www.helmetharbor.com/ who does a lot of business on-line and asked for his opinion on the VR-2R after viewing a couple of his reviews on Youtube.com. (Like I said – I’ve searched everywhere) He hadn’t carried KBC helmets in his showroom since 2006 and he also stopped carrying them on-line for a couple of years, although he is now carrying them once again on-line. His explanation for not carrying KBC was in regard to this top vent issue. He said the vents were falling off the helmet before the customer left the parking good! He called KBC-USA and they were aware of the issue and according to the rep, the new factory in China had mistakenly left a high-dollar batch of glue (used for holding these vents on the helmet) outside in 40 below temps, which ruined that batch of glue! KBC used the glue anyway, putting defective vents on the market for some of their 2006 model lids. Once discovered, it quickly became a "warranty claim" issue, which is how KBC ultimately decided to handle the vent problem. Even though I disagree with KBC’s solution, the company did offer to make things right! That’s a positive step in my opinion! Of course this is "old" news, but it ultimately inspired the second upgrade. That upgrade was a design-change of the top vent, with the first new batch of helmets receiving these re-deigned vents beginning with late 2008 models. This vent re-design information was freely offered by the KBC rep I spoke with. In fact it may not even common knowledge two years later. In any case this CSR was telling me the truth, because he described the new vents perfectly, as they are the same vents used on my VR-2R. Not to mention I also placed another call to KBC-USA and spoke with a "different" CSR who gave me the same info. I’m sneaky that way. Both versions are easily identifiable. The "older" vents use a tiny black lever in the center of the vent to open and close it, while the "new" design slides the entire vent cover to the side. Both are still on the market depending on the manufacture date. It’s a snug fit. Although every step-by-step instruction I’ve been given and/or read, regarding helmet sizing, says: snug is better! Once the helmet is on my head however it doesn’t feel too bad. Although in the very beginning I had to wiggle the helmet around a bit to get my ears in the proper position, as the snugness of the helmet tended to fold my ears over. Wearing a helmet liner fixed that issue though, but after two months of wear the helmet’s liner seems to have "formed" to the shape of my head and I no longer have this issue. Once again referring to webbikeworld.com, the writer complained about how short the chin bar was on the VR-2, stating that his nose literally touched the chin bar. This isn’t an issue with my VR-2R, even though I have the same "size" helmet (XL), which the writer used in his review. In fact my nose doesn’t even touch the breath guard, much less the chin bar. He also said his chin stuck out from under the helmet. No such issue for me here as well. Only thing I can figure – this guy must have a big head and a rather large nose! Bless his heart. I guess maybe he should’ve chosen a 2XL instead. The only concern (in the beginning) seemed to be a possible pressure point in the forehead area. I’m sure a portion of that concern was primarily due to the "newness" of the helmet, which as stated, has since conformed to the shape of my head and I no longer have this pressure point in the helmet. Although a couple of the reviews stated this same issue, as the helmet broke in this seemed to go away. One guy unfortunately wasn’t as lucky and literally removed the liner in his helmet and "lightly tapped" on the EPS foam to compress it enough to fix the problem! Obviously I would NOT recommend you do this for the purpose of a good fit! Anyway, now that my helmet seems to have broken in a bit, the XL seems to be just fine. So keep this in mind when you’re sizing a VR-2R for your head. Ventilation is a "key" feature for me, as I sweat (sometimes in buckets) depending on the amount of energy I’m exerting. Even during a snow storm – I can sweat! During the summer all I have to do is walk outside for a few minutes and I’ll start to sweat. And putting something on my head that’s going to decrease or restrict the amount of "airflow" around my head only intensifies things just that much quicker. Ventilation? YEAH, it’s important! I think it’s note-worthy to mention "exhaust" vents. These are now common on every helmet manufactured today. And without question these exhaust vents are a huge improvement! Even if the airflow is minimal at best, at least the hot air inside the helmet now has more than a couple of small spots to escape. You don’t have to be a physicist to know that heat rises and it would simply stand to reason, that the higher you can place these exhaust vents on a helmet the more effective they will be at exhausting hot air out of the helmet. The VR-2R has a total of six (6) exhaust vents. Two are up high on the back of the crown, while the other four are positioned about midway down the back of the helmet. Just looking at these exhaust vents, tells me they will definitely move more "heated-air" out of the helmet than what my old X-8 ever could. So how did the VR-2R do? Not too bad. I’m satisfied with how the VR-2R performed even though it's considered a racing helmet. I've read both good and bad reviews regarding the venting on this helmet and I’m inclined to ride the fence on this one, leaning toward the positive side. There isn’t a real rush of air although I could definitely feel air moving around my face, which is a welcome plus. Feeling air coming in from the top vents was a little more difficult, but could still be felt, although the CoolMax helmet liner I wear could easily have "impeded" my ability to feel that airflow on the top of my head. Considering that the liner has not been wet with sweat, I’d say the top vents are working as designed. As for noise – I personally don’t ride without earplugs. Some reviews of the VR-2R indicate the presence of a slight whistle. If it's there, it’s so minor that I’ve not been able to notice it. Not enough for me to give the VR-2R a bad report card in this area. Wind noise over the helmet is normal, and the chin curtain does actually help. The one thing that REALLY stood out was the aerodynamics of the VR-2R. I could turn my head with ease (to check my "six") and never felt my neck muscles tense in the least while doing so, as I’d become accustomed to having to do with my old Shoei X-8. This helmet ROCKS in this department! Even passing semis doesn’t create a neck-tightening, buffeting experience. The lack of effort in turning my head in the VR-2R is a welcome change and I’ll have to give it high marks here! The ONE thing that I did notice in the beginning that I thought could be an issue was the distortion at the top of the mirror/chrome visor. This caught me by surprise as it was rather noticeable in the beginning, but less than a dozen rides later I hardly even notice it anymore! It’s not that big of an issue and probably more than acceptable for street riding. However if and when the angle of attack gets more acute/prone (as say on a track day) this might be an issue for some riders! The bottom line for me, it’s been a hard pill for an old Shoei-head like myself to swallow, but the simple fact is, these new-comers to the helmet industry (such as KBC) are making helmets that are almost as good as a Shoei or an Arai in some aspects, while in other aspects, they ARE every bit as good. And the HUGE price difference makes it even harder for me to feel like another Shoei is worth the extra expense as I once believed. I’ve finally had to accept that fact. I just bought a KBC Magnum (The "Mugello" color scheme). The closeout price at bikeBandit hit $39 (Everywhere else is $69-$169 still) so I jumped on it. I love it, very comfortable, the texture of the lining feels alot nicer than some of my previous helmets, close to that of a Shoei or Arai. The helmet fits sunug, as it should, but there are no 'hot spots' or areas that the inner shell or foam touches your head. 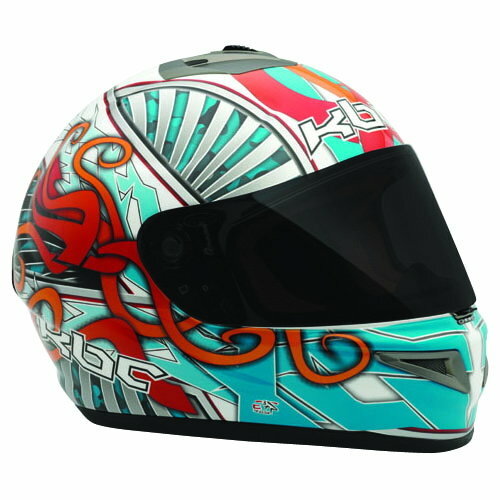 The helmet is relatively quiet, has good ventilation and even came with a free smoked shield.